Poppies Hotel in Bali offers just twenty luxuriously appointed thatch-roofed cottages that nestle in gardens of hibiscus, scented jasmine, and frangipani. Red brick paths meander past lily ponds, waterfalls, and time-worn stone figures, watched over by the towering palms of an ancient coconut grove. Over the past four decades many of the true Bali-philes have made their way to Poppies. Today, despite being a veritable institution, Poppies is still being discovered by those new to the delights of Bali. 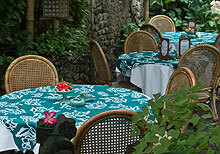 Poppies restaurant is renowned for fresh seafood or tasty Indonesian and international cuisine in a romantic tropical garden setting. In a secluded corner of the garden is the swimming pool and jacuzzi area, set amongst natural rocks and cascades, discreet sun-bathing terraces and riotous banks of bougainvillea. 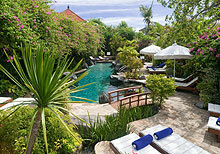 Steps lead up to a peaceful reading room, and to the intimate pool bar, a cool escape for drinks or lunch. 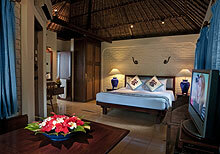 The simple Balinese exterior of each cottage, with its private garden and breakfast terrace, belies the spacious and well thought out rooms that lie within. 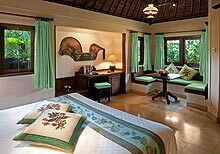 The interiors are decorated with colourful Indonesian fabrics, and include a host of thoughtfully provided creature comforts as well as local artefacts and discreet design details. Adjoining every room is a hidden garden area that conceals a charming bathroom featuring a sunken marble bathtub and shower. We are happy to have received a Certificate of Excellence for 5 years in a row.